Then a Seattle businessman, Steve Tyner wanted a weekend place where he could “get my hands in the dirt.” He bought the property and over the years his family enjoyed campfires and campouts at their place in the woods. They never built a cabin, preferring to be close to nature. Now 69 years old, he can’t take care of it the way he used to. When Great Peninsula Conservancy approached him about buying his land to save it forever for salmon, he was interested. While Great Peninsula Conservancy waited for a salmon grant from the state that has been held up by the Legislature, Tyner suddenly changed the plan. In December he donated the land, valued close to $250,000, to Great Peninsula Conservancy. The Suquamish Tribe has documented the importance of Curley Creek for salmon (estimating 2,500 chum salmon are in the stream each fall), and where there are salmon and big trees there are bear, birds and other wildlife. Great Peninsula Conservancy will protect the land as a nature preserve and hopes to lead tours of the property. “Thank you to the Tyner family and Great Peninsula Conservancy for their generosity and vision. 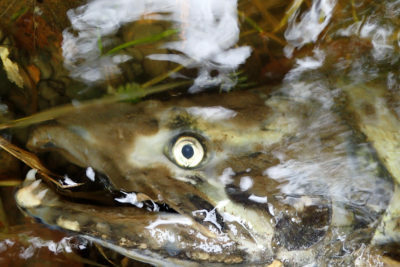 Selfless acts like this are what we need to preserve creeks like Curley, an ancient Suquamish Village site, and the wild salmon that have returned here for thousands of years,” added Suquamish Tribal Chairman Leonard Forsman. Funds to assist with the transactional costs of the purchase and future stewardship of the property were provided by Clif Bar Family Foundation, Hugh and Jane Ferguson Foundation, MJ Murdock Charitable Trust and members of Great Peninsula Conservancy.